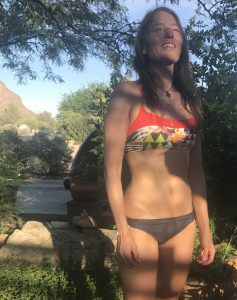 A few weeks ago, I posted a photo that my neighbor and friend took of me in my new swimsuit (my first item as a Prana influencer, and I just loved it) as I was headed off to the pool. 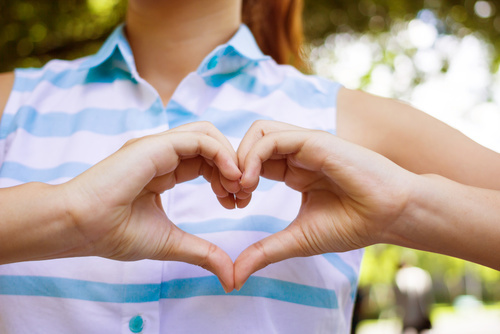 It happened to be the night that my latest online course registration was ending, so I paired it with a reminder about that, along with a heartfelt sharing about what it means to me to “love your body.” (In essence, that I believe you can love yourself first, love yourself as action of treating yourself lovingly…which nourishes a healthy body…which you’ll then probably love all the more, because being truly generous and loving toward yourself tends to bring you to better shape. So, not waiting for your body to be a certain way so THEN you can love it.) See more here. I understand that nobody’s going to think being “shamed” or minorly hand-slapped for enjoying your own fit and healthy body (and saying so) is “harder” than being shamed for not fitting some cultural ideal. But, shaming is shaming, too. And I think we really have to question and examine why we might consider it arrogant, showing off, or otherwise offensive to enjoy your body, love your body, appreciate your own body…and to share that fact. To enjoy walking around in a swimsuit…especially if you’re 53 years old. 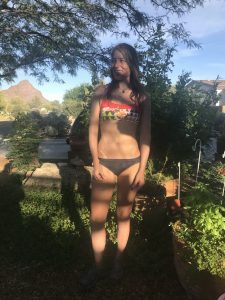 To enjoy your body and your swimsuit because you take awesome, informed, inspired, joyful care of yourself…and you actually want to share with people what’s possible when you do that. 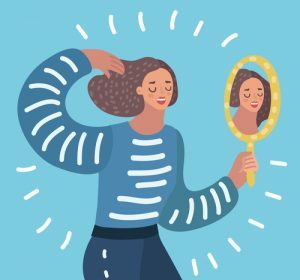 I say we ought to celebrate when a woman over 40 or 50 actually enjoys and loves her body, and is just contented with her fitness and appearance (not because she’s perfect, because I’m not, believe me, NO one is and certainly not me—but because she pleases HERSELF, and doesn’t really give a crap what anyone else thinks). We should celebrate it because it’s all too rare, and we need to sincerely and thoughtfully examine what that’s really about—why it’s so rare, what are the nuanced tributaries of that river—instead of railing generically at “cultural ideals” as if that is the one simplistic cause of our own self-loathing. We sure don’t help by turning around and also labeling people who actually have that thing (self-love) that we sit around the rest of the time scratching our heads and wringing our hands about NOT having. Are we ever satisfied? When people hate themselves, you rant about how this needs to change. And then when someone genuinely grooves on their own self…we vilify that too? How twisted are we that not only must we shame people when they don’t match up to our ideals of beauty—but we also shame people for feeling good in their bodies, for feeling beautiful, and sharing that. How is it that we find it offensive (or at least dismissible) rather than aspirational when someone actually feels happy in their own skin? Especially if they’re not just showing off and flashing abs, but genuinely trying to share a possibility—share how much more easily and joyfully it can be done than you may think, and break down barriers to finding your own healthiest strongest fittest body. The healthiest version of YOU not someone else, being comfortable in your own healthy resilient skin. To open up new ways of thinking and seeing….that lead to people doing what we already know works. Because we DO know what works, that part’s NOT a mystery (for all the headline-making contrarianism that sells stuff and bamboozles/confounds the unfortunate many). See David Katz’s “The Myth of Mystery” for what I think is the blessedly definitive word on this. I’ll say it again: I have the body I do largely because I love it. Let me say that again: I don’t just love it because I have it. I have it because I love it. Because I love on it and I love it up in my actions. Because my love of it is a VERB. It’s a stand I take. The love didn’t just come over me, or get bestowed on me because I got to a certain place. I didn’t make myself get to a certain place so I could THEN love myself. I loved myself and so I gave to myself and that got me somewhere. I didn’t wait to be a certain way in order to care for my body and respect it and give it love. And I love to share how I did that. It works, and I am overjoyed about that. It is my particular brand of service. No two people are ever going to look the same or feel the same, nor should we. I won’t look like someone else and they won’t look like me, but it’s not about that—it’s about being the best ME or YOU possible. And enjoying it. And most people can be the best they can be by treating themselves lovingly—including in some particular ways we know to be especially generative. Most people can be a lot healthier and fitter then they think just by learning some essential things that almost no one is really teaching them (for all the random, hyped up, extreme minutia bio–hacking going on) and then doing it. Lovingly. Learning not just what to do but more importantly how to live and love those things, as an expression of who they are and what matters. There is a potential for health and fitness and well-being—especially at certain ages—that people tend not to believe is possible but that really IS possible. People often don’t know what to do and/or aren’t inspired to do it, but when that gets addressed, this higher potential can be achieved. It’s not random or pure luck. Of course I’m lucky also, and I’m endlessly grateful for that. But that’s not all it is. You can screw up great genetics—or maximize less than ideal genetics. And if I can embody and evoke this possibility, I’m damn well going to share pictures of what I look and feel like in a swimsuit. And if I genuinely enjoy my body – which is something of a miracle for almost anyone but especially a 50-something women in this culture – I’m not going to be shy about it. Because it’s something people need to know is possible. And because honestly, I believe that more than anything, most deeply, that’s what people want. Not to look hot, but to feel joy. And p.s., right here and now, if anyone thinks I don’t know what it feels like to be unhealthy and out of shape and low energy and fat….you only need to see pictures of me in my childhood, teens and 20s. The years when I got beaten up every day after school because I was so chubby and schlumpy. The days when I was terrified of sports because I got picked last for every team so many times. The years when I was always sick and tired because I didn’t know what the f**k I was doing and thought “eating less and exercising more” was the answer (because that was about all anyone every has to say about it—and crazily, still often is). Our past does NOT need to determine our future. I am but one example of this. Again, why not celebrate this rather than shame? What makes those girls want to sneer at her rather than bless her? We need to look more deeply at that impulse. At any rate, in honor of this (I know well-meaning) comment I got, I’m posting another, different photo from the same day—sweet new swimsuit, long graying hair and all… and if anyone is offended by it, I don’t apologize. It’s just a swimsuit. It’s just a body. I’m just a woman headed to the local pool, feeling happy and grateful because it’s summer, and I had a course full of people signed up who I can serve and share this perspective with. And I have a body that works well and is healthy and strong and able, and I have the joy and privilege of supporting / coaching / training / teaching others how to help themselves become the best healthiest most resilient and agile version of themselves. And love it. So I’m not showing off. I’m showing UP. “Self–care” isn’t about spa treatments (necessarily). It’s taking care of yourself because you care about yourself. About nourishing and nurturing and GIVING to yourself what you need because (a) you know what that is and (b) that shows up as a priority for you, and you want to fuel what matters to you. This conversation has been left out of the health and fitness lexicon for far too long, and it’s a conversation I’m ready and willing to open up further with whoever is ready. P.S. – I really like this piece on self-care by author Elizabeth Gilbert. It’s not exactly the same message, but it’s complementary for sure.